Getting rid of grubs in your lawn is easier than you might think. Unfortunately, it does take some advanced planning, so if you’re just noticing a problem now, prepare to invest some time into solving this problem. The good news is professional lawn pest management can help shorten the process, so you can enjoy a grub-free lawn sooner than later. Grubs are just baby beetles, and in Georgia, they’re often the youngest form of Japanese beetles. These can quickly overtake your lawn and leave with waves of adults come July. Any gardener would cringe at the prospect, but in the spring, there are steps you can take to prevent this from happening. Whether or not treatment is needed in spring, however, depends on how many grubs you find. 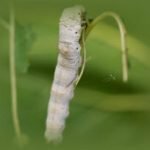 Sift through your yard’s soil looking for small white worms. If you find more than five per square foot, it’s time to research pesticides. Otherwise, focus on beetle management, fortification and fall lawn control. Invest in a quality fertilizer. Most people don’t realize what grubs really do. They’re unsightly and disgusting, but if it were just a matter of having the heebie jeebies, they wouldn’t be such a big deal. 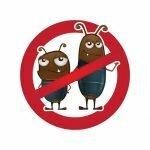 No, grubs directly impact the look and health of your grass by eating through the root system and leaving it susceptible to further injury and disease. Applying a quality fertilizer can help repair this damage and prepare the grass for the grub treatments to come. Take advantage of professional treatments. Spring grubs are mature and harder to kill than new hatchlings found in fall. This also means they’re capable of munching up even more of your lawn’s root system. If you’re looking at an infestation, it’s best to call in the pros. Get access to proven pesticides and application methods to avoid a flood of beetles later on. Now is the time to get ahead of next year’s problems. Whether you’re working with a service company or handling your grub problems yourself, preparing for fall will maximize your efforts. 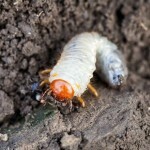 Spring grubs quickly transform into beetles, who go about the busy working of eating and laying more eggs. By fall these eggs are just starting to hatch, releasing tiny, weak grubs ready to release a new wave of damage if you let them. Stop them in their tracks before they burrow under the soil for winter, and you will enjoy a (basically) bug-free summer the following year. Now that we’re into spring, it’s time to get rid of grubs in your lawn. If you’d rather leave this task to the pros, just Think Green! Call us at (678) 648-2556 today to get rid of grubs in your lawn as soon as possible.